At this year's MAINTEC 2009 exhibition at the NEC, Schaeffler (UK) Ltd (stand 53) will showcase a number of new products and services for the inspection and maintenance of plant and machinery, including torque measurement products and oil analysis services. Visitors to the stand will have the opportunity to see how these new products and services can help improve machine availability, minimise plant downtime and reduce overall maintenance costs. Specialists from Schaeffler's maintenance and asset management division FAG Industrial Services (F'IS) will be on hand ready to offer their expertise and guidance. Visitors can learn, for example, how to reliably mount and dismount bearings and how the latest vibration monitoring systems can support a company's predictive maintenance regime. Schaeffler will showcase a number of new products at MAINTEC 2009, including its new ATEX-certified FAG ProCheck system. 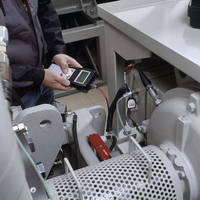 Developed to help companies monitor vibration levels on critical rotating plant or machinery, including electric motors, drives, bearing arrangements, gearboxes, pumps, generators, ventilators, fans and excavators, FAG ProCheck is an online monitoring system that enables maintenance teams to monitor vibration levels and diagnose faults on critical rotating plant and machinery, preventing costly machine breakdowns and eliminating problems before they occur that interrupt production. The ATEX-certified version can be used in hazardous gas or dust environments and has a range of communications interfaces so that it can be easily integrated with a company's existing plant management or production control and maintenance systems. Also on the stand is Concept 6, Schaeffler's intelligent lubrication system, which can be used for either single or multi-point lubrication. Concept 6 can be used in harsh conditions and is suitable for both indoor and outdoor use. Battery-powered or machine-controlled, each system discharges precise amounts of lubricant to bearings over extended periods, optimising their performance and increasing service life. Providing optimum operating conditions for rolling bearing solutions is critical in increasing machine availability. Schaeffler's Arcanol range of rolling bearing greases includes 15 different types, each graduated to cover all application areas. Visitors can discuss how to optimise bearing lubrication techniques with F'IS specialists on the stand. The FAG Detector series of handheld vibration monitoring and balancing devices will also be demonstrated on the stand. The latest version of FAG Detector III, version 3.4, has been updated with a host of new software features, making condition monitoring easier and more accessible to engineers of all skill levels. For more information on Schaeffler's range of maintenance and relubrication equipment, please visit www.fis-services.com or telephone the marketing department on 0121 351 3833. With a total of 66,000 employees at over 180 locations around the globe and group sales of 8.9 billion euros (fiscal year 2007), the Schaeffler Group is one of the world's leading rolling bearing manufacturers and automotive component suppliers. The corporate group includes the INA Group with headquarters in Herzogenaurach, the FAG Group based in Schweinfurt as well as the LuK Group, with headquarters in Bühl.